The Policies and Procedures site on Bridge is a place for employees to quickly find information on the policies and procedures they need in the performance of their jobs. Certain users are granted access to maintain the policies for their departments. Policies and Procedures are organized in a system of folders. Folders and subfolders are organized according to the division and/or department they belong to. Each folder is a category within WordPress and each subfolder is a subcategory of another category. Users are only granted access to the folders/categories as designated by their department or area leadership. Users cannot add/edit/delete a policy that is not within their designated category. The policy and procedure files themselves should be uploaded in PDF format only. It is up to the policy custodians, or site users, to maintain up-to-date listings each year and keep an archive of all current and previous versions of policies offline. Bridge should be the location of current policy. 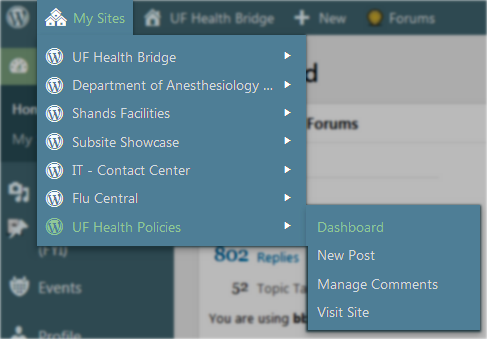 To find the UF Health Policies site, in the Dashboard Navigation Menu, hover your mouse over My Sites and click on the UF Health Policies site, then Dashboard. 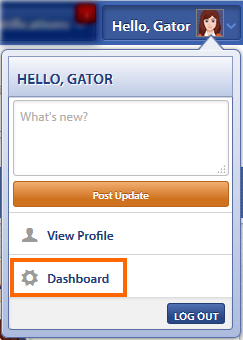 Click on Policies in the Dashboard Navigation Menu, then select Add New. Enter the official name of your policy in the Title field, and check to make sure you have categorized the policy correctly. Under Policy Information, click on the Upload Policy This will open the Media Library. In the Media Library you will locate the PDF, or upload the PDF, that should be placed in this article and click on Upload Policy. Add the Policy Number to the Policy Number field, and select the Revision Date. Click on Media and locate the PDF file for the policy you want to update. A window titled Attachment Details will load. Look for the field called Replace media then click on Upload a new file. Select the file that will replace the one on Bridge and then click on Upload. NOTE: The option to “just replace the file” is chosen by default. An updated version of the Attachment Page will load. Click Update to save the changes. 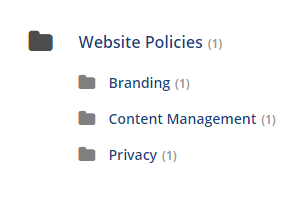 Click on Policies in the Dashboard Navigation Menu and locate the Policy you just updated. In the Policy Information area just below the title, edit the Policy Revision Date to match the date the file was revised or uploaded. Click on Policies in the Dashboard Navigation Menu, then hover your mouse over the title of the article that should be deleted. Choose Trash and the policy will be sent to a trash folder and taken off the web. However, should you need that policy again, it is easily retrieved from the Trash.